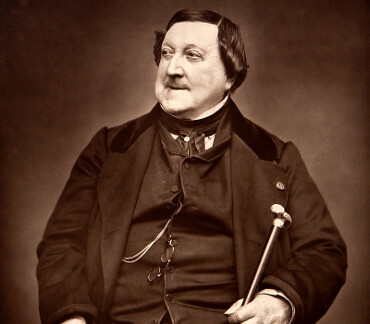 Gioachino Rossini was an Italian composer who wrote 39 operas as well as sacred music, chamber music, songs, and some instrumental and piano pieces. His best-known operas include the Italian comedies Il barbiere di Siviglia (The Barber of Seville) and La Cenerentola (Cinderella), and the French-language epics Moïse et Pharaon and Guillaume Tell (William Tell). A tendency for inspired, song-like melodies is evident throughout his scores, which led to the nickname „The Italian Mozart“. Until his retirement in 1829, Rossini had been the most popular opera composer in history. composer (1792-1868). 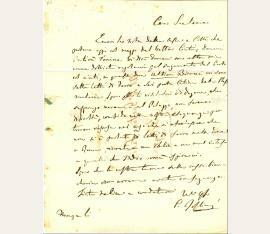 Autograph letter signed ("G. Rossini"). Bologna. 8vo. 1 p. on double leaf. Letter of recommendation for a clarinet player, addressed to Sig. Campieri at Mantova: "[...] io ve lo raccomando col massimo calore [...]". - Somewhat browned and spotty, some edge damage. Italian composer (1792-1868). 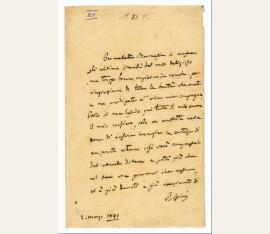 Autograph letter signed ("Rossini"). Florence. 4to. ¾ p. Bifolium with integral address panel. Framed. 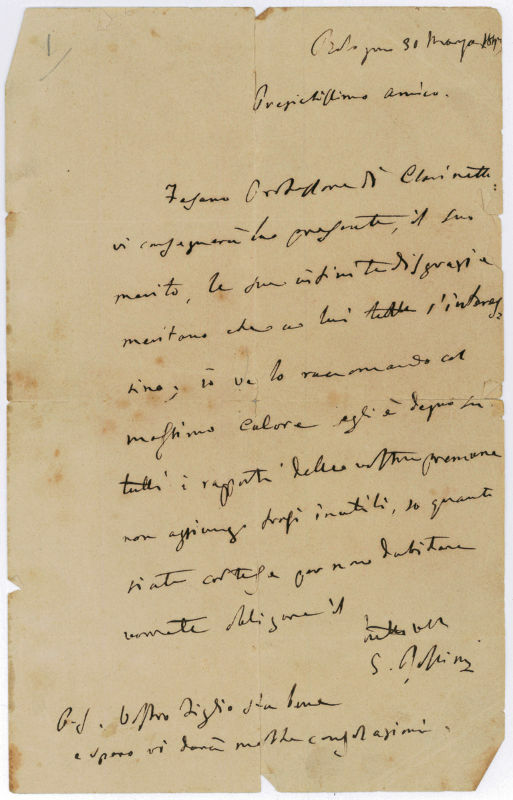 Letter to the Italian tenor Domenico Donzelli (1790-1873), informing him of the good news he has heard about "Rosmunda" from Venice: "Fino da ieri sera io sapevo le notizie di Rosmunda che mi vennera direttamente da Venezia avendo in cità uficiale persone per tale ogetto [...]" ("Since yesterday night I have news about Rosmunda which has reached me directly from Venice, as I have officals in town for that purpose"). 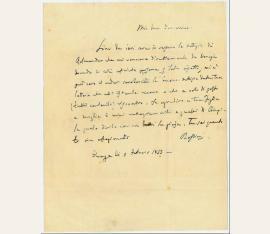 Rossini expresses his happiness to read the good news also in Donzelli's letter which he has just received and writes with great affection: "Fa agradire a tua figlia e moglie i miei rallegramenti e questi di Olimpia la quale divida con noi la gioa. Tu sai quando tu sia afezionato" ("Let your daughter and wife have my congratulations and those of Olimpia, who shares our joy. You know how much you are loved")..
Komponist (1792-1868). "Gammes". 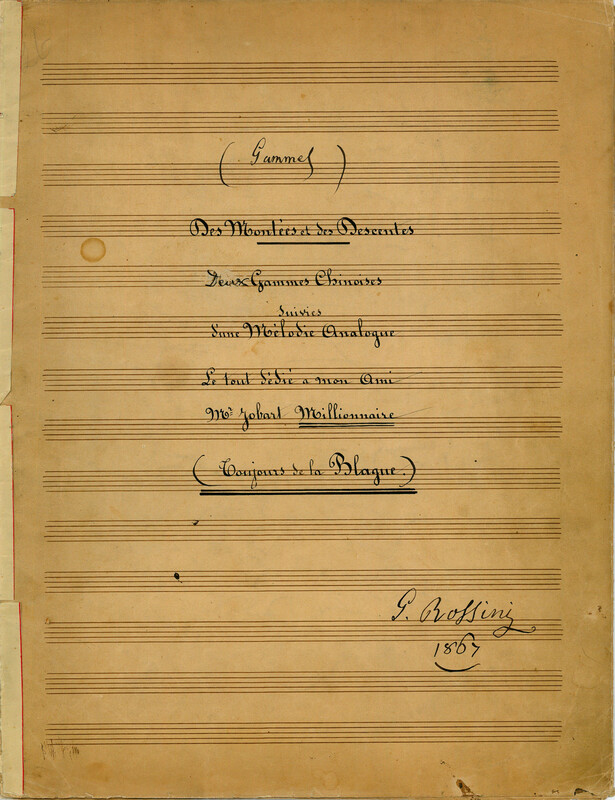 Musical manuscript with autograph revisions, signed. O. O. (14) SS., die letzte unbeschrieben. Fadengeheftet und in Kartonmappe. 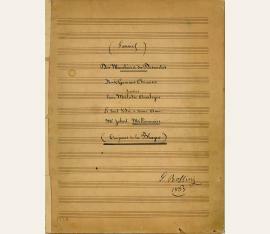 Folio (276 x 360 mm). The full title of these modulation exercises, written but a year before the composer's passing, is "(Gammes) / Des Montées des Descentes / Deux Gammes Chinoises / suivies / d'une Mélodie Analogue. / Le tout dédié à mon Ami / Mr Jobart Millionnaire / (Toujours de la Blague)". Rossini, who had written his final opera "Guillaume Tell" in 1829 and spent the remainder of his life concentrating on sacred music and chamber music, had in 1857 begun to compose a series of musical collections which he withheld from his publishers but which he would play for his numerous visitors. "The collections, which he termed 'Sins of Old Age', were given by his widow to the Liceo Musicale in Pesaro; only from 1954 onwards have some of them acquired a wider renown due to publication by the 'Fondazione Rossini' (Pesaro)" (cf. MGG XI, 953f.). Among these "Sins", collected in 13 volumes and two supplements, are more than 100 pieces for piano which are notorious for their witty titles such as "Tortured Waltz", "Asthmatic Etude", "Chromatic Turntable" oder "Miscarriage of a Polka Mazurka". The present pieces encompass: [p. 1] "Montée" for piano; scribal hand. [pp. 2-3] "Descente" for piano; scribal hand with a small correction by Rossini on p. 3. [p. 4] "Montée" for piano; scribal hand. [p. 5] "Descente" for piano; scribal hand. [p. 6] "1ère Gamme Chinoise Montante et Descendante" for piano; scribal hand with a few erasures and corrections by Rossini. 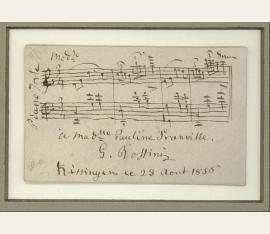 [p. 7] "2ème Gamme Chinoise Montante et Descendante" for piano; scribal hand, but rather thoroughly revised by Rossini. [pp. 8-12] "L'amour à Pékin. Petite Mélodie sur la Gamme Chinoise" for piano and voice. The first words of the title as well as the text of the song are in Rossini's hand; also, some of the music (in the scribe's hand) has been revised by Rossini. - Traces of handling and fingerstaining at edges; binding a little loosened, but well preserved in lilac-coloured custom portfolio..
Gioachino Rossini (1792–1868), Komponist. E. Brief mit U. („G. Rossini“). Florenz, [14. März 1849]. 1 S. 4°. Mit e. Adresse (Faltbrief). – An Gaetano Fabi betr. einer Lieferung von Waschtischen, Betten und anderem Hausrat, den er mit einem Leiterwagen schicken wolle: „Eccovi la nota delle [...] e letti che portano oggi col mezzo del [...], domani partirà Tonino. Vi dirò domani con altra mia come dobbiate regolarvi pel pagamento del […] col […], in quelli due ultimi Bironi [?] vi sono sette letti di ferro e sei porta catina della stessa materia, spero che li visitatori di dogana, che suppongo verranno al palazzo, non faranno difficoltà, confido nella vostra eloquenza per trovare risorsa nel caso che si afacciasse che non si è parlato di letto di ferro nella domanda a Roma, ricorete a un oblio o un mal intesoo quello che Iddio vorrà ispiravi […]”. 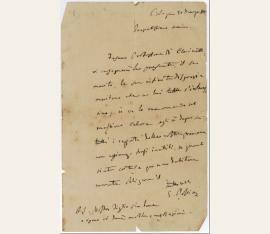 – Der Komponist war im Jahr zuvor, dem Revolutionsjahr 1848, von Bologna nach Florenz übersiedelt, „da an seinem Hause einige Pfuirufe auf den ,Reaktionär’ erschollen waren” (MGG XI, 952). – Mit kleineren Randläsuren und kl. Papierdurchbruch an einer Stelle durch Tintenfraß. Eigenh. musikalisches Albumblatt mit Widmung und U. ("G. Rossini"). Four bars from a piano waltz: "A Madlle. Pauline Granville [...]". - Some browning due to paper. Eigenh. Brief mit U. ("Rossini"). 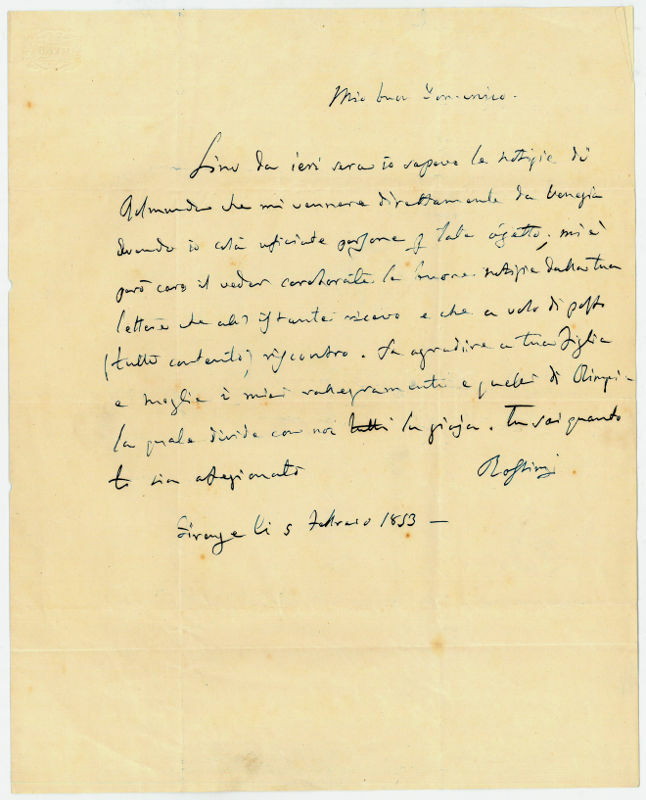 In Italian, to "Madame La Baronne de Wetzlar", thanking for all her kindness shown to him during his sojourn at Venice, which he quits with a heavy heart: "[...] lascio qui tutto il mio cuore il mio pensiero, solo mi conforta nella pena di lasciare Venezia la certezza di un pronto ritorno [...]". - Some brownstaining.